Stress is not a big problem in my life, and that is a blessing. When I gather with other UU ministers, I hear from many of my colleagues that they are stressed. A 2014 study by a leading "Christian think tank" has shown that stress and exhaustion in pastoral ministry causes as many as 70 percent of pastors to regularly consider leaving, and many of them actually quit. I see very clearly what’s stressful about this calling, but I am not chronically stressed, for which I am deeply grateful for the blessing of zen practice in my life. (I am also really enjoying my time in White Plains, and for that I'm also grateful to the wonderful congregation I serve.) Other practices might serve that purpose just as well – I don’t know about those. So I can personally testify to calmness, peace, a sense of well-being, and manageable levels of stress. This is a blessing that I wish for every one of you. At the same time, I am often very distracted, ADD, and unfocused. The things that I myself say – repeatedly – help with that – when I really listen to them and take them to heart. That’s my story. Let me tell you about someone else who is an enthusiast for mindfulness. There’s a US congressman from the Midwest named Ryan. No, not Paul Ryan. 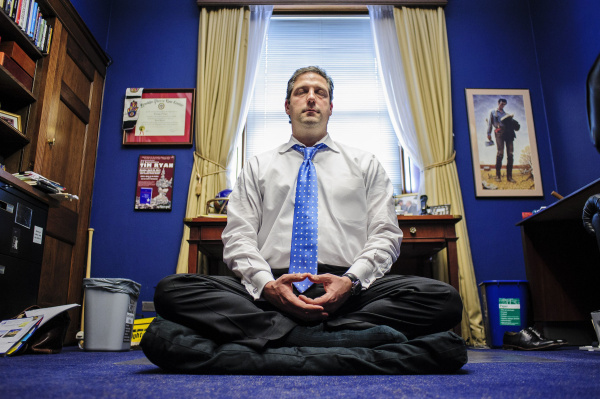 Congressman Tim Ryan from Ohio’s 13th congressional district was first elected in 2002 at age 29. He’s now in his 7th term. Three years ago, Tim Ryan came out with a book: A Mindful Nation. Not what I would expect from a sitting congressman. 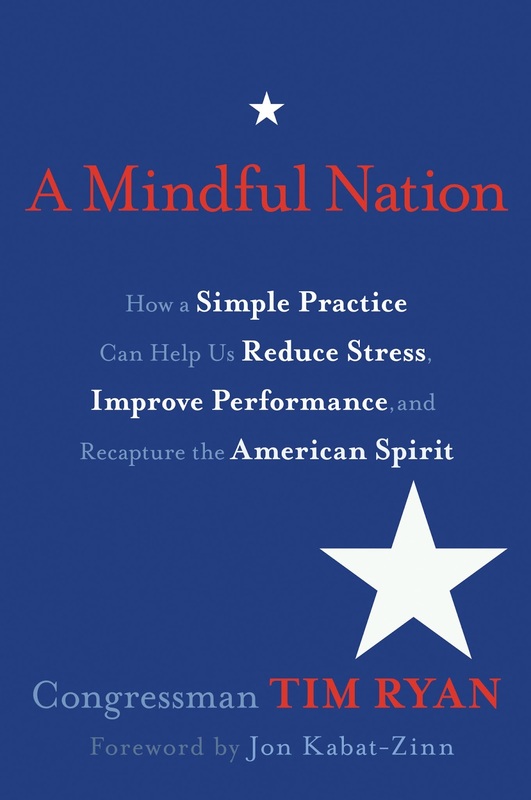 Full title: A Mindful Nation: How a Simple Practice Can Help Us Reduce Stress, Improve Performance, and Recapture the American Spirit. It seems that sitting still and being quiet for a while each day – and trying to be mindful throughout the day – is not only a spiritual discipline but a patriotic duty. Then, in 2005, Jon Kabat-Zinn came out with another book: Coming to Our Senses: Healing Ourselves and the World Through Mindfulness. There was a 100-page section on mindfulness and politics, so Kabat-Zinn’s publisher mailed a copy to each of the 535 members of Congress. Casting bread upon the waters. You never know. Maybe one of them will read more than a page. And one of them did. Congressman Tim Ryan read the copy of Jon Kabbat-Zinn's book that Kabat-Zinn's publishers mailed him: Coming to Our Senses: Healing Ourselves and the World through Mindfulness. A couple years later, Ryan went on a 5-day mindfulness meditation retreat led by Jon Kabat-Zinn. Five days of mostly silence, with instructional talks and guidance sprinkled in. Five days of practicing bringing attention to immediate experience -- the mind wandering off, and being brought back. Mindfulness in our schools: how it can increase our children’s attention and kindness. Mindfulness in our hospitals and doctors’ offices: how it can improve our health and our healthcare system. Mindfulness in our military, police, and firefighters: how it can improve performance and build resiliency for the military and first responders – and how, later on, mindfulness is the path for coming to terms with PTSD. Mindfulness in the workplace: how it can help us rediscover our values and reshape our economy. This is part 2 of 3 of "Mindfulness"
Actual wisdom and perspective from that Den of Inexhaustible Posturing otherwise known as the U.S. Congress—be still, my heart! Thanks for this bright calming pebble of hope cast upon our roiling waters, Meredith!